Of these 21 essays by the South African-born Nobel Prize winner, all but five appeared first in the New York Review of Books; of the remainder, all but one appeared as introductions to single texts or collections. The odd man out is a study of Arthur Miller’s screenplay for John Huston’s film The Misfits and this singular instance of toe-dipping is one of the shorter pieces that Coetzee produces as an instance of his recent forensic preoccupations. As the book readily displays, the critic-writer’s devotion to a particular topic is not necessarily linked to the length of his analysis; still, he gives only teasing suggestions of what he finds interesting about the poems of Hugo Claus and his observations on Beckett’s fiction leave you thirsting for more – much more. Admittedly, all three of the briefest essays – on Miller, Claus, and Beckett – were written to meet functions outside the NYRB format but their elliptical, inferential qualities leave you wanting amplification on many points. Towards the end of his introduction to Beckett’s short fiction, Coetzee makes reference to a philosophical line stretching from Descartes to Derrida which begs for explication; at the same time, he notes that the Irish-born writer began his career ‘as an uneasy Joycean and an even more uneasy Proustian". The first writer is an obvious and well-known influence, but a link with the prolix creator of A la recherche du temps perdu waits in vain for any elaboration. Inner Workings falls into two fairly even halves. In the first, the authors treated are almost all central European; all belong to the 20th century. 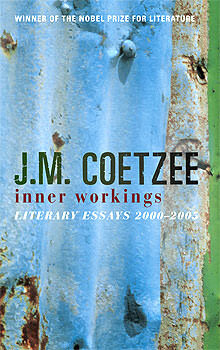 Coetzee examines well-known writers like Italo Svevo, Robert Musil, Paul Celan, Günter Grass and W. G. Sebald, shining his searchlight over their range of work, not just confining himself to the task at hand; rather than confine himself to a focused discussion of Musil’s The Confusions of Young Törless, Coetzee presents a compelling overview of the author’s life and other fiction which has the odd effect of inspiring research into Musil’s period rather than buying the text itself. In fact, the European essays make for hard reading, chiefly because the writer’s detours – to describe social milieux, a writer’s peers or family, problems in translation, historical backdrops – dazzle in their demonstrations of Coetzee’s polymathic intellect but are all too often more interesting than the context in which they appear. For instance, the five paragraphs towards the end of the Svevo essay that deal with the various versions of the phrase ‘malato immaginario’ entertain for their account of differing levels of translation (even without mentioning Molière) while the encircling information concerning the Italian writer’s works and their content presents in comparison like dour generalizations. In this first half, an outstanding essay on Grass reveals Coetzee’s authoritative and perceptive overview of the author’s entire output that satisfies a moderately informed reader, even if the final page seems like an afterword on German dialects and the difficulties of rendering demotic speech in another tongue. Centred round the novel Crabwalk, this review involves a fascinating study of how Grass fuses an historical incident – the 1945 maritime disaster of the sinking of a refugee transport, the Wilhelm Gustloff - with the lives of fictional characters in the context of post-World War II Germany and all the tragedy and trauma following that country’s partition. Both in these pages and in parts of the extra-European material, Coetzee rouses interest in an author for his/her own qualities, rather than in any incidental material that drops out of the analytic process. For the collection’s second part, we are in more familiar territory, beginning with an all-too-brief report on Graham Greene’s Brighton Rock, then changing pace for a deft, wry examination of the context to Whitman’s poetry, complete with the writer’s contradictions of character and the levels of reception that dogged Leaves of Grass, all treated in a context that includes Whitman’s fey homo-eroticism. Other Americans given cordial treatment are Faulkner, Bellow, Philip Roth in an intriguing study of The Plot Against America. As a singular Latin foray, an instructively detached review of Memories of My Melancholy Whores by Márquez is included, Coetzee commenting on the author’s ability to drift into ‘morally unsettling territory’ but giving few clues concerning his own judgements on the novel’s unproductive perversity. 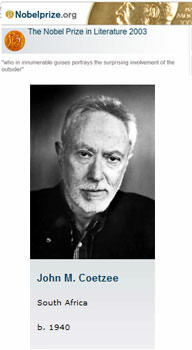 Despite the obvious breadth of his knowledge and the incisiveness of his commentaries, Coetzee stays aloof from most of his subjects. As a fair critic, he gives even-handed judgements about arcane authors like Walter Benjamin, Bruno Schulz and Sandor Márai, assessing their work with an assurance that reveals an understanding of its direction and accomplishment but that abstains from proclaiming genius where there is only fitful talent. The best wine comes late with an appraisal of the collection’s only woman subject, Nadine Gordimer, this chapter revealing a level of sympathy for The Pickup and a short-story collection, Loot, that brings both books to life with unexpected vividness. A similar revelation of different layers of structure and meaning is accomplished in the book’s final essay on V.S Naipaul’s Half a Life, about which Coetzee (for once) probably gives his readers too much direct information. But in both these studies, as in an extended review by Kingsley Amis, Orwell, or Greene – all master-writers and critics – you are left with a determination to see for yourself, to test the commentator’s findings against your own: that desired if rarely achieved outcome of critique in any art-form. Unfortunately, this persuasion to engage with author and critic arose rarely for this reader, especially after negotiating those many pages where Coetzee’s edifying knowledge simply got in the way. Recent articles by Clive O'Connell. A selection of 31 one-line poems.